Fewer things in life bring about as much joy as two people coming together in marriage. Even so, many couples find the stress of orchestrating all the pieces of this monumental day so overwhelming that it obscures the meaning behind their looming union. We spoke with several bridal experts and asked for their best advice on how to overcome the common hurdles associated with planning the “big day.” Whether it’s a wedding of 300 attendees at a lavish venue in Center City or a more intimate ceremony in a refurbished Bucks County barn, here’s how to do it right. The first step is to establish a budget and venue, according to Michelle Finley, vice president and sales manager of Finley Catering, which has several elegant event venues in Philadelphia and the surrounding suburbs. She suggests the anticipated wedding date, overall theme and the number of guests should steer the decision-making process. Date flexibility can improve a couple’s chance of reserving their dream venue, while generously providing a shorter planning window— less than the typical year and a half required for most venues. In some cases, discounted rates may apply. 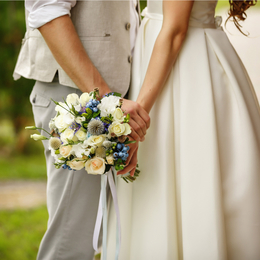 Aside from personal aesthetic preference and date, couples also must consider whether the venue has a day-of coordinator who handles the event from start to finish. This individual offers tremendous value, because he or she will “make sure everything runs seamlessly,” Finley says. Also, there’s the issue of catering services—meaning, does the venue provide them, or does another vendor need to bring them in? Having a venue with its own kitchen—as well as associated needs, such as tables, linens and chairs—may be the most efficient way to get everything accomplished. The next step: choosing a bridal salon. Shopping for a bridal gown should never evoke stress, according to Gabrielle Frederico, co-owner of La Belle Mariée in Bucks County. She advises beginning the search early to weigh all dress options—from the mermaid silhouette, to the classic A-line gown—and to make sure the “right” dress can be delivered in time for the big day. Not all newly engaged couples have the luxury of an eight-month shopping period, however. Circumstances can arise unexpectedly— a sudden military deployment, for example. In these cases, an able bridal boutique will have an ample selection of off-the-rack gowns for sale—and they’re usually available at significant price reductions. But for brides who would rather not buy a dress off the rack, Frederico says select designers offer rush shipping. While some aspects of wedding planning have not changed, some traditions have. This includes the shapes, styles and colors of bridal gowns. For example, some brides want something livelier and more unique than the historically popular white gown. Likewise, wedding day cakes have evolved, too. Popular trends include the naked cake—with minimal to no icing— and, quite the opposite, the elaborately detailed ombre cake. Robert Bennett, owner of Classic Cake, which has a production facility in Philadelphia and a retail location in Cherry Hill, N.J., says the flavor and customization options are nearly endless. The fun comes from tasting all the different flavors—everything from a seasonal pumpkin spice buttercream frosting, to an indulgent chocolate chip pound cake—but, like every other aspect of wedding planning, be sure to leave plenty of room for due diligence. Some couples choose to forgo a traditional wedding cake and have instead offered smaller, less intricate desserts—or, in some cases, none at all. Bennett has a theory: “Some couples have dietary restrictions, and others might not be able to afford it, but that shouldn’t prohibit a couple from getting a cake. We make a delicious gluten-free cake for those with celiac disease, or can even make a personal-sized cake for just the bride or groom if they would prefer not to have an entire gluten-free cake. Of course, don’t forget the floral arrangements. But the planning should go far beyond a beautifully made bridal bouquet. If you’re envisioning an exact color palate for your flowers to seamlessly assimilate into your bridal party colors, Letendre suggests re-thinking your vision. Above all, experts agree on the most important piece of advice: Simply enjoy the journey.